Home » Featured, Foreign Affairs » Foreign minister returns from meeting with Guatemalan at O.A.S. As we reported on Wednesday, Belize and Guatemala have been meeting with the O.A.S. in Washington. Foreign Affairs Minister Wilfred Elrington, along with a delegation of government officials, returned this morning, following a round of discussions with Guatemalan Foreign Affairs Minister Fernando Carrera and O.A.S. Secretary General Miguel Angel Insulza. The purpose of the meeting was for all parties to commit to holding a referendum on elevating the territorial dispute to the International Court of Justice in 2014. While a precise date has not yet been set for the joint referenda, another meeting is scheduled for June in Guatemala to iron out the specifics of the future exercise. Postponing the referenda, according to Elrington, does not contravene the Special Agreement signed between both countries in 2008. This man is a joke a traitor to his country makes me want to vomit. I agree with you @rod. Until today I only thought Sedi is a weak man, an appeaser, who will lose every confrontation because he has no principles, no patriotism, and no backbone. But he’s less than that, he’s the lapdog of the Guats. A liar, too, saying everything about the Guat maps and passports never existed. We’ve seen it, and the Guats admitted it! 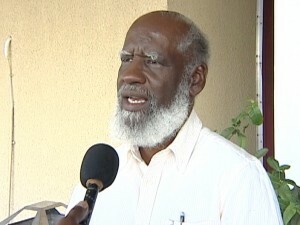 This man is minister for belize or the public relations officer for guatemala? Everytime he on tv it is to justify guatemala actions. Why he no just go live de instead? And take all his stupid advisors with him too. Bunch of dodo birds. If this were any other country in the world, do you think this guy might be put on trial for treason?